This recent rally was precipitated by the cancellation of campaign events for both campaigns in "swing" states along the Atlantic coast due to the steadily approaching Hurricane Sandy over the weekend. 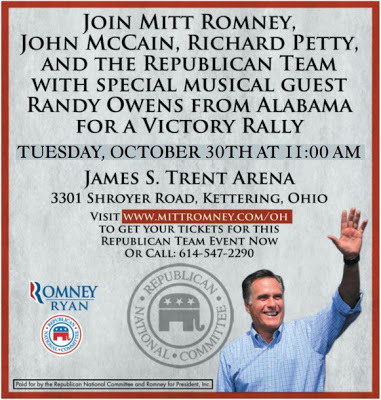 It was not until Sunday afternoon at around 2PM that news about this rally was announced on several local news outlets. I doublechecked the Romney campaign web site and I saw the details concerning the date and time. Wanting to cover this as a journalist, I next searched their site for information on requesting media credentials. I found a page that allowed users to submit press inquiries and I submitted my information to await confirmation of my request. On Monday morning, I opened my newspaper and saw the ad displayed above announcing the event and the list of scheduled guests. 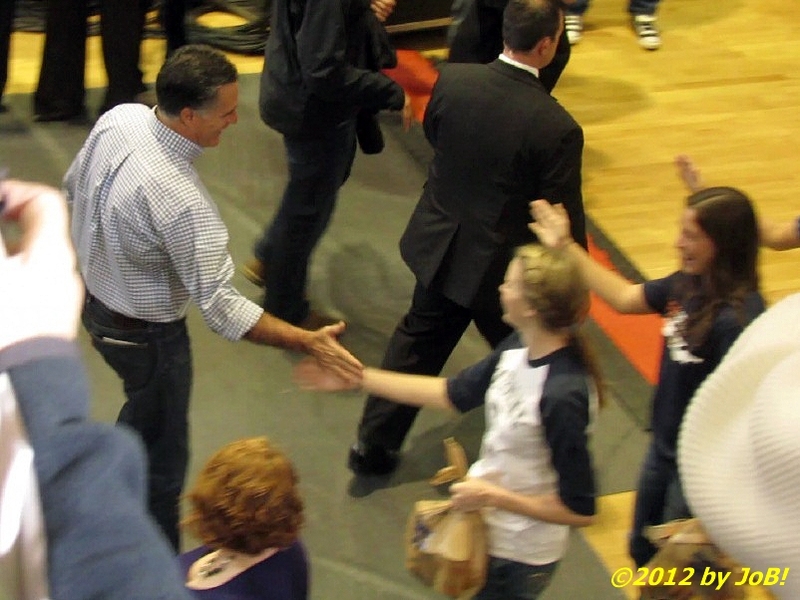 I next checked my email to see if there anything was returned from the Romney folks and was disappointed to see nothing in my in-box. I went back online and found a site that linked to the event organizers and I submitted an inquiry about press entry to them and hit the 'send' button. 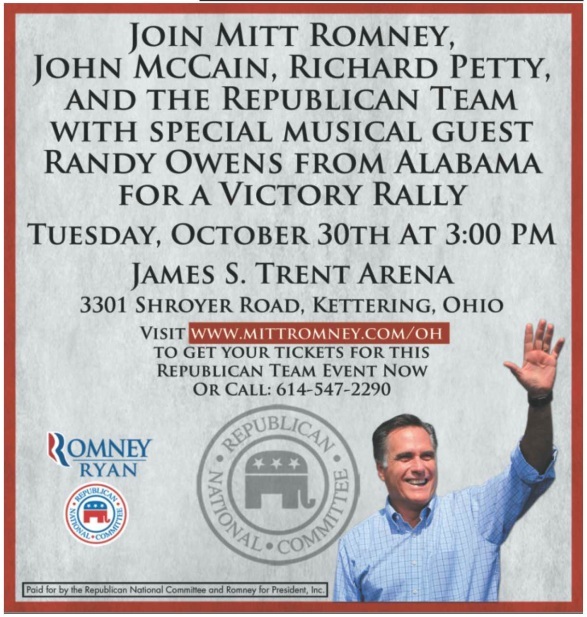 I was starting to get a little worried but shortly after noon, a text message from The Dayton Daily News told me that the event was being cancelled. I took them at their word, and when I went off to work a few hours later, I assumed that my Tuesday would be a free day. I could not believe what I was seeing. Not only was the event back on, but it had changed the time from 3PM to 11AM--less than two hours from when I saw that ad. Needless to say, I had to make a quick decision. 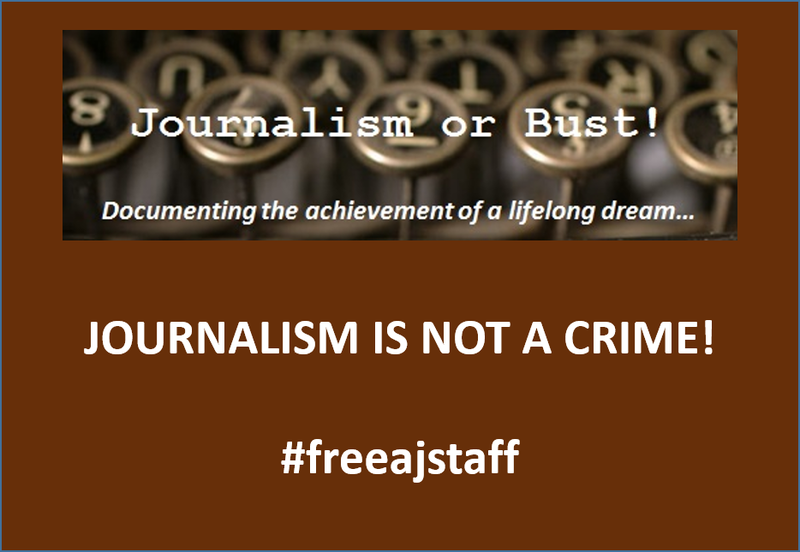 I still had not received any feedback from the press contact or the event organizer about media credentials so I was not entirely sure that I would be allowed inside if I went there. As I have learned during my reporting experiences, sometimes you just have to ask the question directly and hope that the answer is not 'no' so the decision was made to head on over to Kettering. After quickly wolfing down my breakfast, a quick shampooing of my "bedhead" hair, and putting the venue address into my phone's GPS system, I drove to the James S. Trent Arena not knowing what I might find there. Ohio was experiencing some of the effects of Sandy (almost winter-like conditions with some falling snow) and I reveled in my choice of wearing a watertight jacket with a hood (with gloves and ear warmers in reserve). I arrived at the location to find their primary parking lots filled so I had to find a space a few blocks away along a public street. 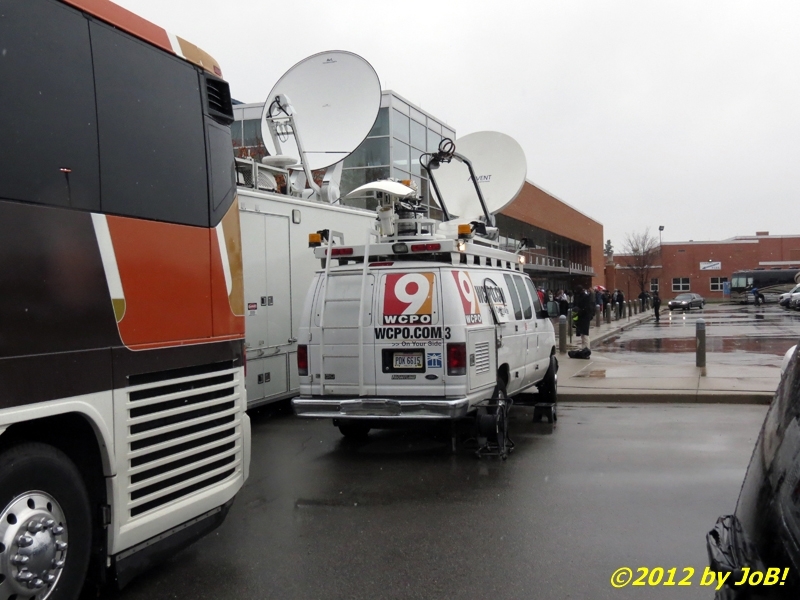 I walked up to the venue and noticed some of the same things one normally sees at these kinds of events: a gaggle of television trucks (with masts deployed) and entrepreneurs selling their pro-candidate (or, in the case of Republicans this time around, anti-Obama) souvenirs. I walked past a long line of people and made my way over to a security officer and asked him where the media entrance was. He directed me to a desk just inside the main entrance and I proceeded inside the lobby doors. I walked up to check in with a woman who had several listings of credentialed people but, unfortunately, I was not on their list. To my relief, she simply asked me for my name and my outlet and, after providing them, handed me a local press badge. She next called over a security officer who escorted me over to one of the airport-like scanners the campaign was using for security screening. My White House press credentials from previous events attracted some undue attention from a few people that I was placed ahead of in line but I was allowed to go through and make my way into the main arena. The Trent Arena is billed as a mid-size arena that can hold up to 4,400 people for sporting events. It has two levels: a main floor and an indoor running/walking track that encircles it. Retractable bleachers were located closer to the floor with permanent seating just above going up to the edge of the track. While most of the attendees preferred to stand on the main floor, several opted for the seats and standing along the upper track's railing for a better view. Varying estimates put the attendance between 1,000 and 2,500 people and, considering the logistics of the arena, something closer to the higher number was probably accurate. 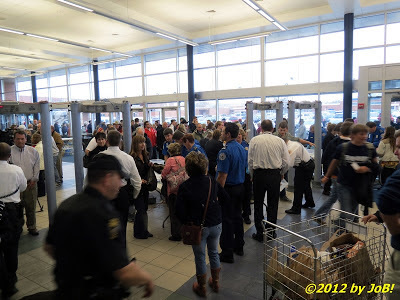 As I looked around, I tried to get my bearings on how this event was going to go down. Although the most recent newspaper ad still had it listed as a "victory rally", the campaign had changed it to a "storm relief event" which would, in theory, make it non-political. The main stage was set up for a band (a drum set and backlighting for the advertised musical guest, former Alabama lead singer Randy Owen) and two hanging screens displayed information on how to text donations to the American Red Cross. 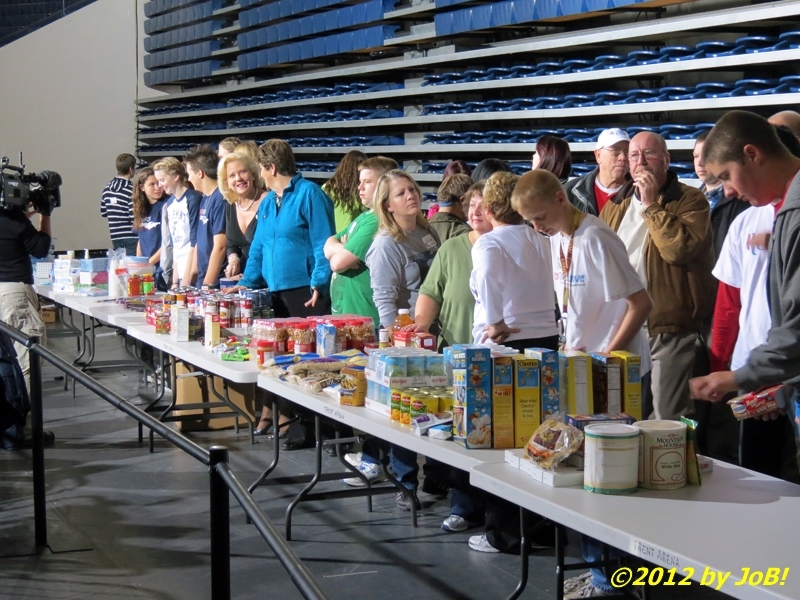 Over to the right side of the arena, several tables were arranged in a line, presumably for taking donations. I got inside around 10:30AM and there were already items arranged on the table as well as in a corner behind them. While waiting for the event to start, I chatted with two Fairmont High School students who were covering the event for their school newspaper (Trent Arena is located on their campus). I also got the chance to see and talk to some national news personalities (NBC News' Peter Alexander, Fox News' Carl Cameron and John Roberts) and local reporters and photographers who were assigned to cover this rebranded rally. Although billed to start at 11, it wasn't until 11:47AM that the former Massachusetts governor (and current Republican presidential nominee) made his appearance. 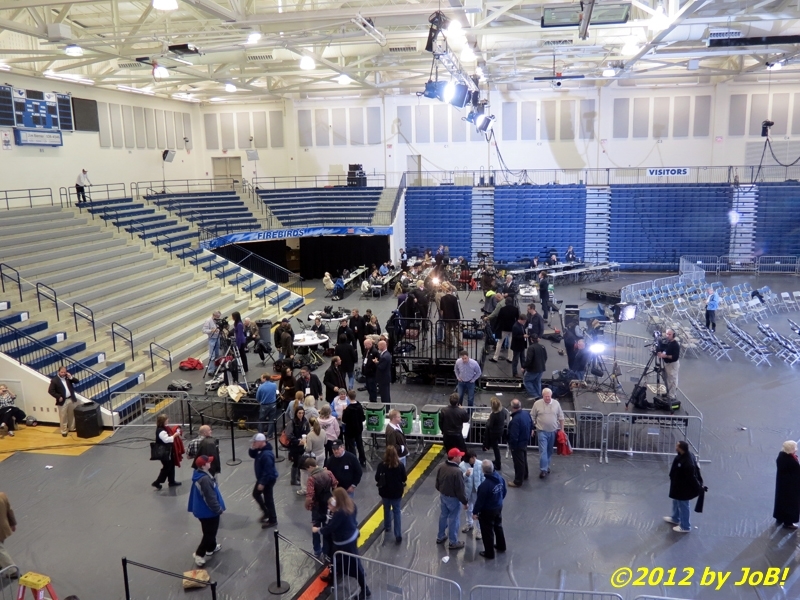 He seemed to throw most of the media off by making his remarks from atop a crate hastily positioned just in front of those tables (most of us thought he would take the main stage and had already staked out our spots up on the main media riser to capture that moment). 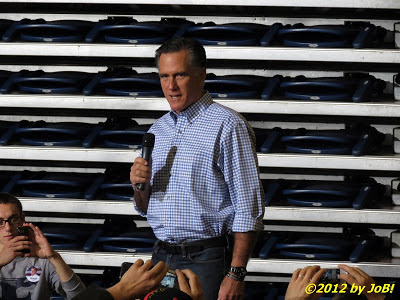 Dressed in jeans and a blue gingham shirt with rolled-up sleeves, Romney spoke for just under five minutes about the importance of small efforts to assist in major disasters. He related his own experiences from high school as well as his time as governor of Massachusetts in the aftermath of Hurricane Katrina to put Tuesday's event into perspective. According to plan, no political subjects were mentioned and he quickly moved behind the tables to help in the collection of donations from the attendees. After about 30 minutes, he left the arena to go help volunteers load those items into a rental truck for their journey to a site in New Jersey that was not immediately identified by the campaign. 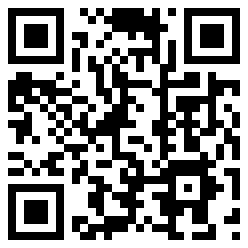 The American Red Cross does not accept or solicit small, individual donations of items for emergency relief purposes. Small items such as collections of food, used clothing, and shoes often must be cleaned, sorted, and repackaged which impedes the valuable resources of money, time, and personnel that are needed for other aspects of our relief operation. The Red Cross, in partnership with other agencies, suggests that the best use for those types of donations is to support needy agencies within donors' local communities. The best way to help a disaster victim is through a financial donation to the American Red Cross. 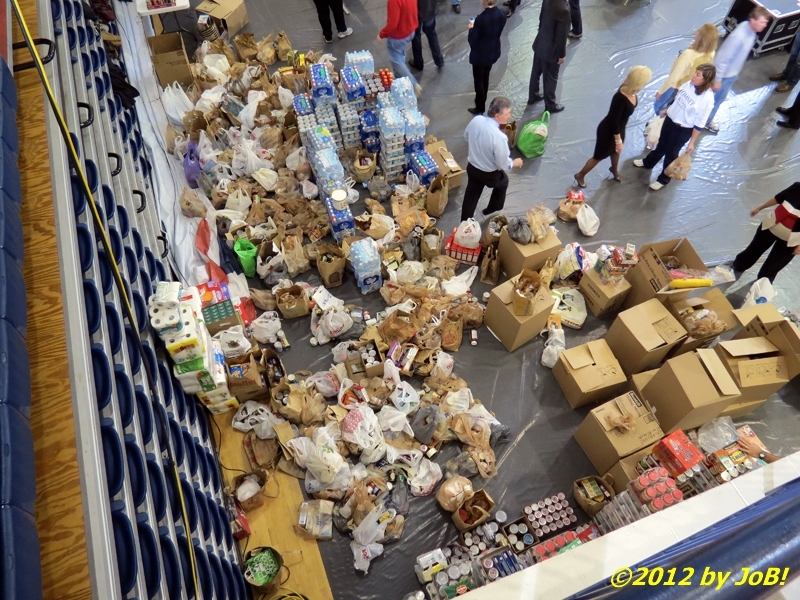 Financial contributions allow the Red Cross to purchase exactly what is needed for the disaster relief operation. Monetary donations also enable the Red Cross to purchase relief supplies close to the disaster site which avoids delays and transportation costs in getting basic necessities to disaster victims. 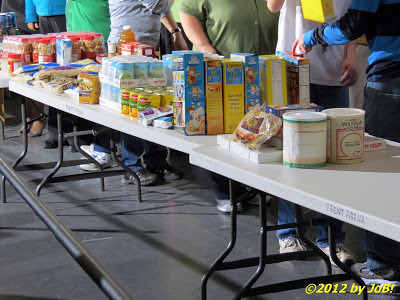 Because the affected community has generally experienced significant economic loss, purchasing relief supplies in or close to the disaster site also helps to stimulate the weakened local economy. In the days following the "storm relief event", several details have emerged that further shakes the credibility of the campaign for not cancelling this event in light of the tragedy that had just befallen many parts of the US's northeastern seaboard. 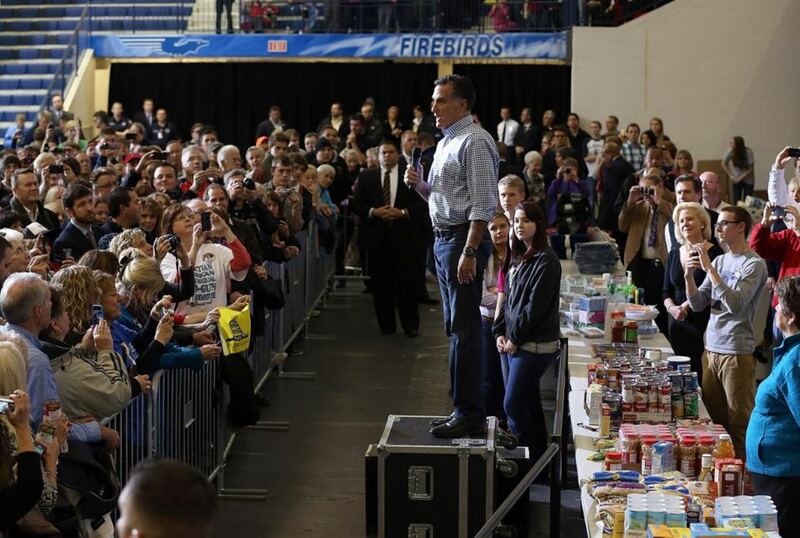 Buzzfeed.com reported that they visited a local Wal-Mart on Monday night to purchase $5,000 for "granola bars, canned food, and diapers to put on display" (and that could explain the items that I saw on the tables before Romney appeared or stacked up in a corner of the arena) so that they would not be stuck with an "empty truck" the following day. They also reported (and I can confirm this) that people wanting to meet the candidate had to have a donation with them before they got in line. 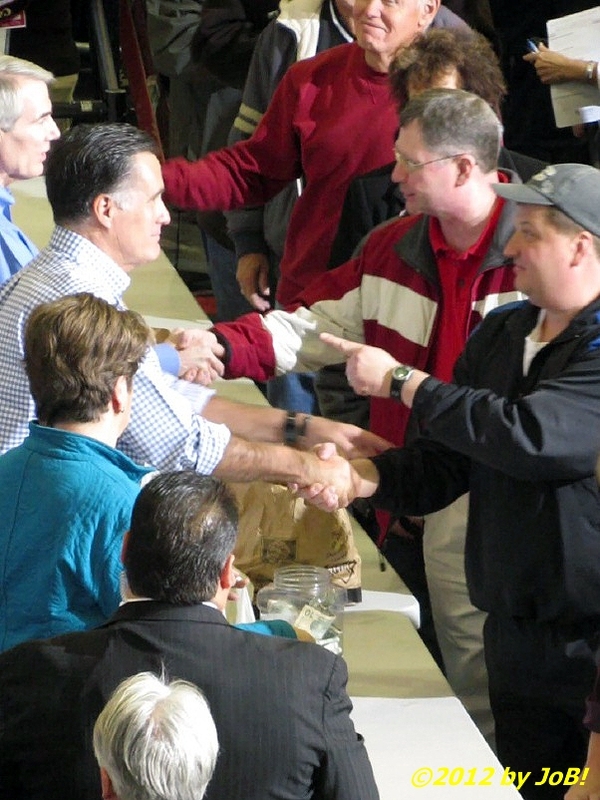 Since many had surrendered their items when making their way through security, they were told to grab items stacked near the candidate for presentation to, and receipt by, Romney. While this event went through a last-minute revision to change it to a humanitarian theme, there were still signs of political influence in and around the venue. Although I did not see it, a campaign video that debuted at the Republican National Convention was shown when attendees first entered the arena (Red Cross messaging quickly replaced it). 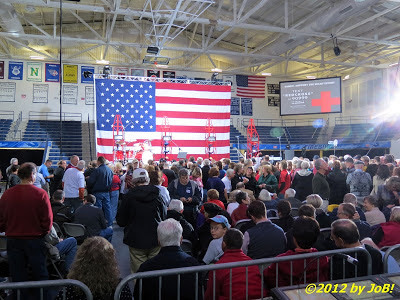 When Romney came out to speak, several people in the front of the crowd were seen sporting campaign paraphernalia, to include a Gadsden Flag that has been adopted by the Republican Party's "Tea Party" movement. The credential I was given called the event a "victory rally" (the campaign said that they were pre-printed prior to the change). And several of the volunteers who were working alongside Romney were well-known Ohio politicians (US senator Rob Portman, US representative Mike Turner, and Ohio state senator Peggy Lehner). Unfortunately, the politician I was hoping to see, Arizona senator John McCain, was a no-show but he did generate headlines at another Ohio location over 100 miles away that same day when he ignored the day's "no politics" rule and attacked President Obama's handling of a terrorist attack on the US consulate in Benghazi, Libya back in September. I also believe that this change was not a comfortable one for the Republican nominee. After months of developing a specific campaign routine, Romney had to abandon that familiar script and try and speak extemporaneously in front of a friendly crowd and some of his word choices (saying "rubbish" instead of "trash" or "garbage") seemed awkward. While he did collect items for about 20 minutes, you could visibly see relief in his demeanor when he left the arena to help load the rental truck with supplies, "high five-ing" several students upon his departure. Throughout the appearance, the media tried to get him to comment on a 2011 debate comment when he said that the responsibilities of the Federal Emergency Management Agency, the federal government's primary disaster response organization, should be delegated down to the individual states or the private sector. 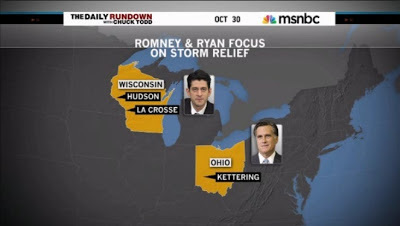 On 14 separate occasions, he was asked to clarify those remarks and he ignored all of them (his campaign did release a statement the following day declaring that Romney was committed to FEMA and would not eliminate or underfund the agency if he is elected president). 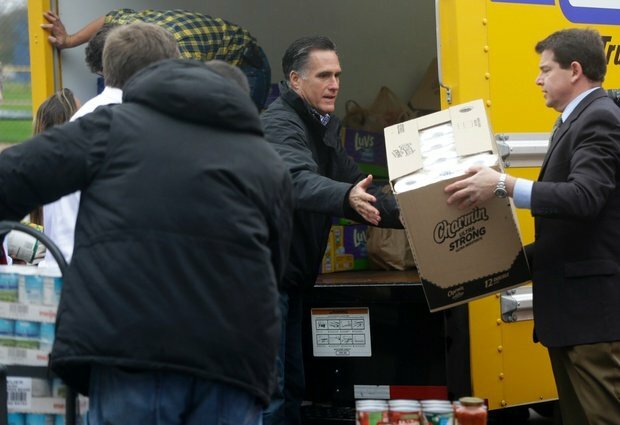 While this appeared to be a lot of work for just a little reward, I feel that the Romney campaign could have used a much more effective method to get their relief message out to the country. 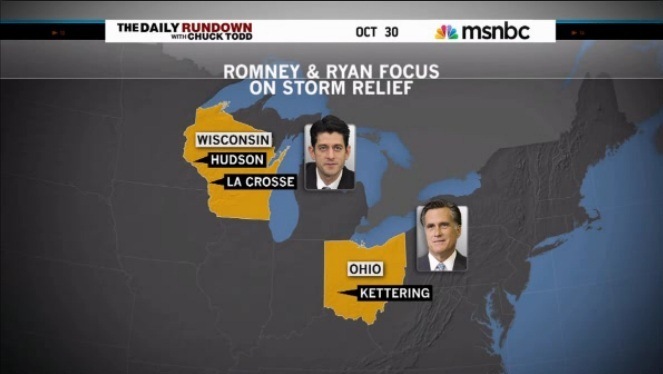 Instead of holding a single event in a state 500 miles away from the affected areas, a public service advertisement with his running mate, Wisconsin representative Paul Ryan, could have been produced to encourage many of the same things (minus the food donations) that the candidate mentioned during that in-person appearance. This spot could have replaced some of their campaign's negative advertisements currently saturating media markets in the nine "battleground" states and kept him within the understood boundaries of political decorum after a natural disaster strikes. Like other missed opportunities during his general election run, this positive initiative might also be seen, in hindsight, as one that got away from him (and perhaps costing him the election). All in all, I am glad that I decided to cover this event but I, along with probably most of the other media members who were there, felt that we were being used to document a swing state "photo op". My initial reporting was objective in nature and I stuck to the details of what I personally witnessed and to the basics of reporting (the "5 Ws" introduced in any introductory journalism class). It wasn't until I started to see other people's accounts of the event--and confirmed details I was not aware of at the time of my posting--that I began to reconcile the instincts I did not initially follow as they surfaced on Tuesday (but documented above). 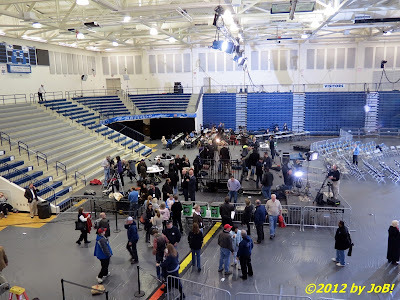 As local press, I was appreciative of the opportunity to cover this event but, as I found out during several Obama events, you quickly notice that you occupy the very bottom rung of the media ladder (with national and pool reporters occupying the higher rungs of access to the candidates). 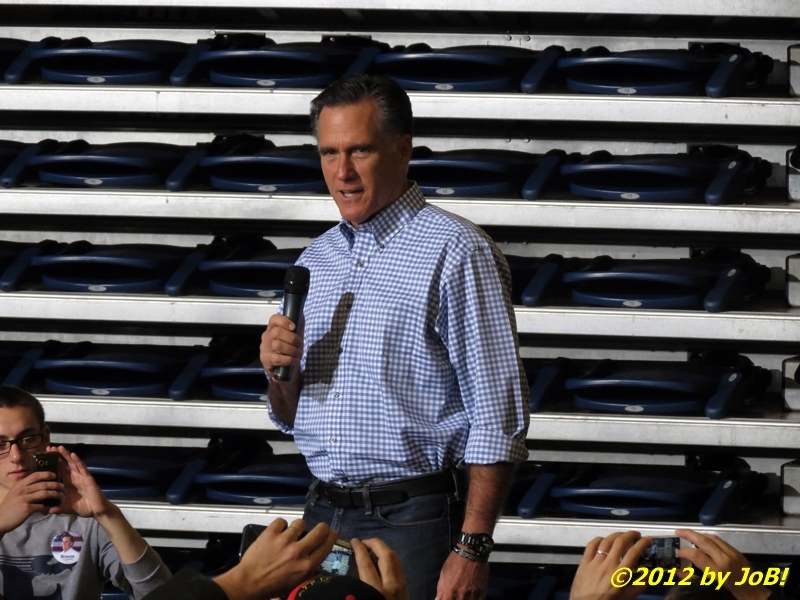 When I tried to get to get a close up of Romney accepting donations, I was told that I was not allowed to be in that area even though I saw other video and still photographers within spitting distance of the candidate. My camera's zoom lens can compensate for distance but, unfortunately, it has no workarounds for obstructions. With Tuesday rapidly approaching, my time covering the candidates and their campaigns in this latest installment of American democracy is, unfortunately, coming to a close. Living in Ohio gave me an extraordinary opportunity to witness and document history at a much more intimate distance than I could have as an ordinary citizen or someone who lives in a "safe" state. I hope to apply the many lessons that I learned along the way towards my journalism studies and the possible future career that I hold out hope for. And to think that we're just four short years from doing this all over again!